Since we are on the subject of Jewish cooking (see my previous post on Joan Nathan's Quiches, Kugels and Couscous here), kosher cooking, though debatable, has a general consensus of being healthier. Once in a blue moon, happens especially when we are downtown DC visiting an exhibit, I do wolf down, a hot dog, and feel much better knowing it is a Hebrew National. Unfortunately this confession I cannot later retract or deny! The next two Washingtonian cookbook authors, while not advocating junk food habits, Kosher is one they do champion. Paula Shoyer of the The Kosher Baker (Brandeis University Press) and Meredith Jacobs of the The Modern Jewish Mom's Guide to Shabbat (HarperCollins) are lovely ladies and young, hip moms and their books are perfect duo giveaways! 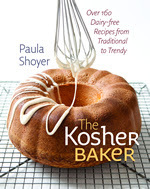 Paula Shoyer's The Kosher Baker with over 160 traditional to trendy dairy free and parve recipes for the everyday and the holidays. The owner of Paula's Parisian Pastries Cooking school in the Washington D.C. area, with a pastry diploma from the Ritz Escoffier Ecole de Gastronomie Francaise in Paris in 1996, Paula used to be the editor of the popular Susie Fishbein cookbooks Kosher by Design. First on my list is the Chocolae Babke and the Challa Beer Bread pudding with Caramel Sauce, sounds scrumptious! The paper thin Chocolate Sandwich Cookies are perfect for my neverending search of that perfect bite with my tea and the Carrot Cake with Cinnamon Honey Cream Cheese frosting is not only dairy-free but also nut-free, a girl to my liking! The Kosher Baker chapters progress from the easy every day delicious baking such as Lemon Rosemary Biscotti Sticks, Pumpkin Cake and Banana Bread to the more complex desserts such as Chocolate Peanut Butter Mousse cakes, with the last chapter dedicated to special diets such as flourless (some gluten free like the Flourless Chocolate Cake) and low sugar or sugar-free desserts. Paula also includes a much needed comprehensive detailed guide to necessary tools, freezing and thawing instructions which are invaluable in planning especially a make ahead menu. I've encountered Meredith Jacobs multi seed beautifully plump challahs as I was getting ready for my Challah & Chutney demo, talk and tastings at Sixth & I Historic Synagogue in DC. Meredith in a modern Jewish air of easiness and lightness was baking these challahs at the Sixth & I kitchen in preparation for her wonderful, cultural eye opening Friday program of Shabbat Around the World. Look for the recipe under Meredith's playful chapter title 'Challah-bake Girl'. The Cranberry brisket sounds awesome fusion of Jewish and Thanksgiving flavors. The Modern Jewish Mom's Guide to Shabbat is intertwined with Shabbat traditions, prayers and favorite Shabbat recipes. Meredith also touchingly pays homage to people and establishments who influenced her most throughout her life. Meredith is not only a cookbook author but also co-authored with her daughter Sophie Just Between Us: a no-stress, no-rules journal for girls and their moms (Chronicle Books, Spring 2010). She is a host of "Modern Jewish Mom" on The Jewish Channel and host of "Connecting Family" on WYPR 88.1 fm (NPR in Baltimore, MD), parenting advice columnist and co-founder and editor of http://modernjewishmom.com/. She hosts the video series "Faith in the Family" available on http://www.beliefnet.com/. Her monthly parenting columns appear in The Baltimore Jewish Times, just to name a few of her accomplishments. 1. Please follow @paulashoyer and @modernjewishmom on twitter. 2. Please follow @foodwanderings on twitter. 3. Please LIKE foodwanderings Facebook page if you got Facebook. 4. Leave a comment on this post! You are encouraged to share a comment about The Kosher Baker and The Modern Jewish Mom's Guide to Shabbat or any other thoughts. 4. If you RT or post on your Facebook page this giveaway post link, you get an additional entry. Please drop me an additional comment on this post saying that you did so. 5. Drawing will be done randomly from all comments recorded by Thur., Nov.25 at midnight and one lucky winner will be announced Fri., Nov. 26. 6. Shipping only in the US. Sorry my friends overseas, I hope one day I could afford the mailing. Disclaimer: I received the review copy of and one extra giveaways copy of The Modern Jewish Mom's Guide to Shabbat as well as a giveaway copy of The Kosher Baker free of charge. I was not solicited neither for my opinions nor my review. At the risk of jinxing myself, I'll be first! :-) I'm particularly interested in Paula Shoyer's books, as I'm always on the lookout for parve recipes that can be served with meat meals. That babka sounds good to me! And I'm now following Paula Shoyer on Twitter. I'm following all three on Twitter and I just RT'ed. I'd love to have both books, but I am particularly interested in The Kosher Baker as I am always on the search for new desserts that everyone can enjoy! Wow, another great giveaway! Both cookbooks sound wonderful and a great addition to any collection! I follow you on Twitter. Just liked you on facebook and am now following Paula Shoyer on Twitter! This book looks fantastic! I just retweet you follow you and liked you on the facebook!...I also want the book!....sounds great! service and follow me on the twitter and join my facebook group miriam's cleaning service! I all ready follow you on twitter and just started to follow @paulashoyer and @modernjewishmom . I retweeted and posted on Facebook to. I would love to win because a lot of kposher recipes are gluten free and my daughter has just stopped eating gluten free.